Imam Shafi’ (Rahimahullah) said that this hadith contains one-third of knowledge. In other words sincerity of intention is a third of knowledge. Imam Abdur-Rahman Al-Mahdi (Rahimahullah), who was a teacher of Imam Bukhari (Rahimahullah) said that if he were to write a book he would start every chapter with this hadith. Sincerity is a principle issue in Islam. He appreciated how difficult it is to keep one’s soul in check; making a good intention was a daily struggle between him and his soul, a struggle, he knew, that would last until his dying breath. A pious man once said that whenever you find a person testifying sincerely to their sincerity then their sincerity needs sincerity. The paradox is that you always have to be doubtful of your sincerity. Junaid who was an ascetic said that the sincere person discovers that his intention changes 40 times a day and the one who is insincere (or shows off) finds that his intention remains firm for 40 years. A sign of sincerity is that you are always challenging yourself. Issues with sincerity afflict every single person of the ummah; from the lowest worshipper to the highest worshipper, and as knowledge grows so does this challenge because you become more exposed to the tendency of insincerity. People may praise you for your knowledge and when the ego is boosted shaytaan will prompt you to seek knowledge for the sake of people’s praise. The solution is not to stop your actions (such as teaching or lecturing etc.) but to find the disease and constantly fight it to death. 1st interpretation – When they were studying with other goals they could not understand the material; they had set up barriers and only when the barriers were removed did the light come in. 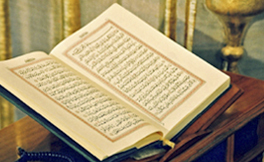 2nd interpretation – They initially began to study for other reasons than Allah’s sake and the more knowledge they gained the more they realized the mistake. The higher they went in knowledge the more did they realize that this needs to be ratified and understood that knowledge cannot be understood until sincerity is clear. (H. 1) The Prophet (Sallallahu `Alayhi-wasallam) said this on the occasion of someone’s emigration from Makkah to Al-Madina not for the sake of the Islamic Cause but to marry a woman who had stipulated that he should emigrate if he wanted to marry her. Anyhow, this Hadith implies a general principle, i.e., one is rewarded for his deeds according to his real intentions and not according to his actual deeds which might be good in themselves but were motivated by ill intention. FYI Waki’ Ibn Al-Jarrah died 196 A.H. / 811 CE. I was just doing a talk about Sincerity at a MAS youth Halaqa yesterday and I came across that quote “whenever you find a person testifying sincerely to their sincerity then their sincerity needs sincerity” and remembered it from Ilm summit. I went back to my notes and forgot where I wrote about it LOL…. Anyway, thanks for this post.